EQ Compact is the latest product released by Origen RV Accessories. EQ Compact 7" pads are made for specialty Equalizer Systems leveling feet. Equalizer Systems specifically requested this version and we were happy to oblige. 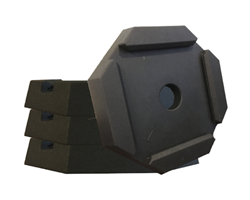 Origen RV Accessories is pleased to announce the newest addition to their growing collection of permanent jack pads for fifth wheels and motorhomes. Made to fit on 7” square/octagonal landing feet, the EQ Compact is the first SnapPad to have a square inner cavity. The unique design was created in partnership with Equalizer Systems in an effort to create the best fit possible. The 7” Equalizer Systems leveling foot is most commonly found on four-point leveling configurations for Class B and C Motorhomes, including brands like Jayco, Tiffin, and Leisure Travel Van models. Jason Loose, Division Director at Equalizer Systems, mentioned this about the new product, “We identified an opportunity to work with RV SnapPad to create a new product line for our 7” leveling feet and jumped at the chance”.